Former England rugby captain Mike Tindall was special guest at the topping out ceremony for a £1 million sports injury rehabilitation centre where he paid tribute to the ‘inspiring’ work of the man behind the Burrough-on-the-Hill scheme. 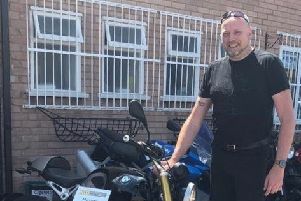 Matt Hampson, who was parralysed from the neck down in a rugby training accident 12 years ago, has set up the Get Busy Living Centre on the site of a former aircraft hangaron the Burrough Court estate. It will be the centrepiece of a remarkable programme of work carried out by Matt’s foundation to mentor, advise and fundraise for other sports people struck down by similarly catastrophic injuries. Mike, who is married to the Queen’s grand-daughter Zara, was on site to see the final touches being put to the structure of the centre, which should be open in the autumn. He said: “I’ve been a patron of the foundation for a couple of years now and over that time I’ve got to know Matt very well. “I have often asked questions of myself and whether I would have the strength and drive to carry on as he has, and to pull other people in a similar situation to himself through their life-adjustments and to inspire others as he does. The facility, which is being built by contractor Wilmmot Dixon, will be a home for injured athletes where they can spend time with their families and build relationships with others in similar situations as well as offering services such as physical rehabilitation. It will also house specialist rehabilitation and gym equipment. The steel structural frame, based on the original footprint of the building has now been completed, along with the completion of an access road linking the existing Twyford Road to the site of the centre. A mezzanine floor has been installed, which will double floor space and extend the length of the building by one third. Matt, who lives at Cold Overton and a former Leicester Tigers and England Under 21 player thanked the foundation’s partners in the project. He said: “It was a fantastic moment for me to finally travel the road up to the site of where the Get Busy Living centre will be.